Research Fellow Tait Brimacombe reflects on her recent trip to the UK for the Developmental Leadership Program’s Annual Conference. See here for conference materials and additional information. In February I travelled to the UK with the Institute’s Director Chris Roche and Research Fellow Gillian Fletcher for the 2015 Developmental Leadership Program (DLP) Annual Conference. The day-long event welcomed over 120 delegates from a variety of academic and practitioner institutions. 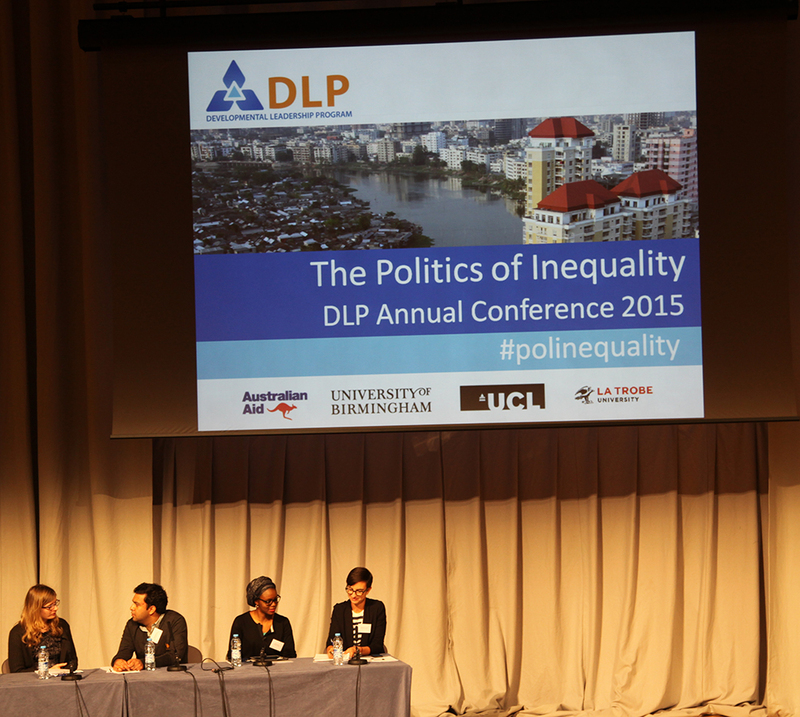 The conference theme, The Politics of Inequality, leveraged recent discussions around inequality and redistribution, from Thomas Picketty to commentaries around recent social movements and institutional transformation – see DLP David Hudson’s pre-conference blog post for more on this. The conference was opened by key-note speaker Professor Frances Stewart who delivered the Adrian Leftwich Memorial Lecture entitled Inequality, Justice and Policy. This lecture considered horizontal and vertical inequality through philosophical and economic approaches to distribution and justice, and examined the question of what just distribution might look like. Following on from this, Duncan Green (Oxfam Great Britain’s senior strategic advisor and visiting fellow at the Institute) reiterated the call for greater consideration of lessons from history in More History, Less Maths: Understanding Development. Exploring a variety of historical approaches to inequality, Green talked about the popularity of Picketty (responsible for so-called Pickettymania) and highlighted recent attempts by the late Adrian Leftwich and his DLP legacy to ‘bring the politics back in’ to these discussions. Subsequent sessions saw presentations from a range of delegates including representatives from the Tax Justice Network and Womankind World Wide, as well as academic institutions such as SOAS, University of Oxford, University of Kent and the University of Manchester. These sessions hosted papers on a variety of themes including the politics of redistribution, measuring inequality and empowerment, elites and inequality, in areas such as Brazil, Honduras, Nigeria, Rwanda and Nepal. The final session of the day was hosted by Institute Director Chris Roche, who used news of Australia’s entry into the Eurovision Song Contest to host a ‘Eurovision themed’ roundtable. The discussion focused on ‘big propositions’ around inequality, with each participant asked to pitch a priority area which, in true Eurovision style, were then subjected to an audience-vote to determine the overall ‘winner’. After a long day of papers and presentations, this roundtable was a refreshing change of pace, particularly for those of us feeling the effects of afternoon jet lag! From a personal perspective, it was encouraging to hear discussion of gender and intersectional inequalities (particularly Abigail Hunt’s paper). Gender inequality and social exclusion, with strong links to discussions of politics and power, are often missing from the agenda when it comes to discussions of political inequality. Hopefully this is a theme that can be examined further when the Institute hosts the 2016 DLP Annual Conference here in Melbourne.